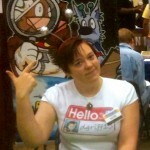 Dawn Griffin is the creator of “Zorphbert and Fred”, a fantastic webcomic about two aliens who come to Earth (disguised as dogs, none the less) to study the human race. Dawn’s initial goal was to become syndicated, but like most cartoonists was faced with the realization that the lifespan of daily comics in newspapers was disappearing, so she took to the web. And now her comic “Zorphbert and Fred” has gained a great following and become highly successful. 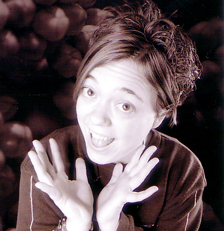 Dawn holds a BFA from Tyler School of Art in graphic design and illustration, and earns a living as a designer. I was thrilled to have Dawn take a few minutes out of her hectic schedule and answer some questions about her life and art and share them here at “Don’t Pick the Flowers”. David: Hey Dawn, you have a great web comic called “Zorphbert and Fred”. How did the idea for your characters and comic come about? Dawn: Thanks David, I wish I could say I woke up one magical morning and had the idea for this comic. However, it was a long and winding road for me. I had retired my first comic “Leftovers” which was my baby for more than 10 years. “Leftovers” was your average college-grads-playing-video-games comic that everyone seems to do, and the syndicates I submitted it to weren’t into it. One rejection letter specifically said the demographic for this comic wasn’t large enough. So, when I was thinking up concepts for this new comic, I wanted it to be a broader idea. However, all the most obvious and broad subject have been done to death. In a round-about way, I came to the idea of a comic about aliens. A: it’s not a subject that’s been done so it’s unique, and B: by making the main characters 100% “unrelatable” to any reader (here on Earth that is), it also becomes open to anyone in a backwards kind of way. No one directly relates to the aliens, but if I make the focus of the comic about humans and the alien’s interpretation of us, it’s basically relatable to everyone. I took a lot of inspiration form the TV sitcom “Third Rock from the Sun”; the 3rd person point of view of humanity always intrigued me. 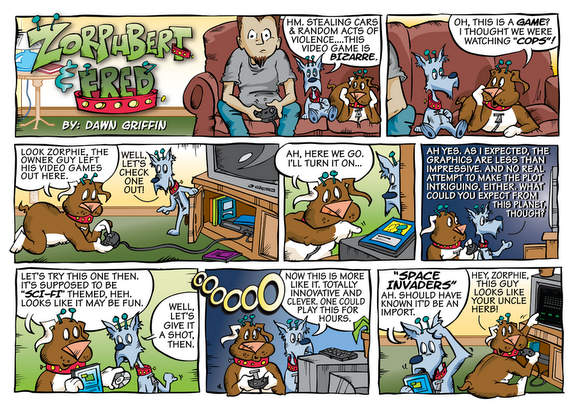 The last step was how to separate the comic from the sitcom, and voila— alien dogs. Cute AND insightful. As for the character’s personalities, I think they’re a twist on the tried-and-true pairing, much like Ren & Stimpy, or Satchel & Bucky, or the classic Laurel & Hardy. It’s classic for a reason: it works. David: What Character(s) are you most like in your comic and how do you feel you relate to them? Dawn: Well the most obvious answer is the female owner, as the young couple who adopts the 2 alien-dogs is loosely based on my husband and me. Like me, the female owner is a bit of a tomboy: into sports and video games, not the average woman… Which makes the aliens research findings a bit funny as she’s not what they expect? However, Fred’s optimism and good nature I would like to think is my softer side…. And Zorphbert’s sarcasm and tireless work ethic is very much based in my personality as well. Oh, and I sure as heck was the “Weird Kid” growing up… So a lot of what happens surrounding the Weird Kid character is based on how it felt to be ostracized as many of us were as children. David: What are some of the issues and topics you like to address when writing your comic? What are the things you hold closest to your heart? David: You also illustrate Abby’s Adventures; can you talk a little about that? Sure! The kid’s books series “Abby’s Adventures” was dreamt up by a friend of my mother’s, who needed an illustrator to progress with her project. In reading the first story, despite being very “girly” for my tastes, I realized what a wonderful message the story had- something that is missing in a lot of the large toy and book industries that are geared towards young girls. In the first story, little 6-year-old Abby looses her tooth on her school’s Picture Day and frantically comes up with funny ways to fill the gaping hole in her pretty smile (like, mini marshmallows, or her Nana’s dentures!). When nothing works, she becomes upset, thinking she’ll never be pretty enough for her picture. Her mother sets her straight, showing Abby her own baby book pictures, when she only had 1 tooth. Abby realizes that loosing teeth is just apart of growing up and that being pretty on the INSIDE is far more important. These types of messages are missing in a lot of what girls are brought up on today— there’s not only one kind of “pretty”, that self-esteem is important and needs to be nurtured by parents. This is why I signed on to illustrate this series, and I’m glad to say it’s doing well. Now taken under Eifrig Publishing’s wing, and boasting 4 books: Picture Day, Dance Recital, Earth day, and Christmas Carol! David: Who are some of your cartooning hero’s? And with that same note, what advice would you give to someone who wanted to start their own comic or web comic? I grew up on the classic comic strips: Peanuts, Calvin & Hobbes, Fox Trot, Bloom County, For Better or For Worse. My first memory, as a toddler, is just a snapshot in my mind, but it was of the yellowed Peanuts curtains hanging in my room. Needless to say, Charlie Brown, Snoopy and crew have been embedded in my life. I adored Calvin and Hobbes, and bought all the collections with my allowance… And between those 2 comics, I knew by the age of 12 or so that I wanted to be a cartoonist. By 14 I was submitting to syndicates, because (as I figured at the time), it took Bill Watterson 10+ years to get syndicated, I had better start young! Once I discovered webcomics, and realized I could take the reigns instead of waiting for someone else to, I ditched the syndication route… Which is probably smart considering where newspapers are headed these days. As for other aspiring cartoonists or creative-minded people who are looking to get into webcomics, I suggest … First and foremost… just keep drawing & writing. Do not worry about the overall story or the finer details, or how to merchandise your concept, or exhibiting at conventions… Put 110% into the comic itself for at LEAST a year. Too many people dive into webcomics, specifically, with more of a drive to merchandise than to draw and write really good comics, and that’s completely the wrong way of approaching it. Building a readership has many key points, but the BIGGEST key is making the product the best it can be. The second suggestion I have is to take a stroll through the Webcomic Alliance website: www.webcomicalliance.com. This is a tutorial/advice website and podcast I am apart of, with the intent of helping up-and-comers and newbies in the webcomic business. The articles cover everything from writing, to video tutorials, to logo design, to conventions. And the community there, full of artists and writers of all levels, is so wonderfully helpful as well, it has been an awesome experience for me. David: Thank you Dawn, I really appreciate you being featured. Thanks for the good advice and sharing about your life and work. 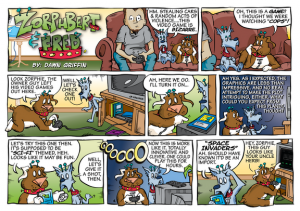 I love “Zorphbert and Fred” and can’t wait to see what’s next with you and your wonderful Aliens! If you aren’t already familiar with Dawn and “Zorphbert and Fred” check out the links below to avail yourself to some incredible fun! This entry was posted in Interviews and tagged Aliens, Art, Cartoon, Cartoonist Studio, Comic, comics, David Hurley, Dawn Griffin, Dogs, Don't Pick the Flowers, fun, Funny, Humans, Humor, Web comic, Web comic Alliance, Webcomic Alliance, webcomicalliance, Zorphbert and Fred. Bookmark the permalink.